Have you ever decided NOT to purchase something because you didn’t BELIEVE what the marketing was telling you? This is true for most of us. We are uncertain and pessimistic about new things because we have been let down in the past. Our subconscious tells us that if something seems too good to be true, it probably is. So we filter out marketing messages and make decisions based on emotion and trust. As marketers we need to find ways to reduce this uncertainty and empower our customers with the information they need to trust us. Trust that we will stick to our word and deliver on our promises. But the more we tell people how ‘trustworthy’ we are, the less authentic it feels. They need to hear it from someone else. Someone they already trust and respect. Bloggers have a small but loyal community that drives significantly more engagement than paid advertising. 70% of online consumers learn about companies for the first time through blog posts, and 81% of people trust the information and advice they read from bloggers. This makes blogger outreach an integral component of our ultimate goal – the building of trust with our customers. Blogger outreach is like a muscle. The first time you flex that muscle it feels a little strange. You’re muscle is weak and you are out of your comfort zone. But the more you persist, the more you refine your technique – the stronger your muscle becomes and the greater the benefits. Blogger outreach is at the heart of my growth strategy here at Blogger Sidekick. What that means is I have tried out a bunch of stuff – some has worked, and a lot hasn’t! I’ve also spent a considerable amount of time consuming information on the topic. The outcome is the step-by-step process you will read in this post and the downloadable Blogger Outreach Spreadsheet. Along the way I will list out a set of tasks I suggest you complete to optimize this process, you may like to download the spreadsheet first and fill it in along the way. Bonus: Download the Blogger Outreach Spreadsheet – it will guide you through each of the steps and tasks outlined in this post and help you implement the suggestions immediately. Before we jump into the step-by-step process for nailing blogger outreach, it’s important to get clear on what outcome you want to work towards. How would you know an outreach campaign had been successful? Perhaps you are searching for backlinks to your site, or you are pitching to feature as a guest writer on the blogger’s site. Maybe you want the blogger to write a review about your product, or is it as simple as a social media share you’re after? There is an endless array of benefits to blogger outreach, but what you want to achieve can impact how you approach your outreach strategy. It can also have an influence on how you measure success. If it is backlinks you want, how many would be significant enough to make the whole thing worthwhile? Write it down. In one simple sentence, write exactly what success would look like. How would you know your approach was working? Task 1: Articulate exactly what success would look like – your desired outcome. Document it in the first tab of your spreadsheet. Note: You may be conducting blogger outreach with multiple outcomes in mind. I would suggest separating your spreadsheet, and outreach efforts up based on these outcomes. See below in the screenshot; Back to contents list. 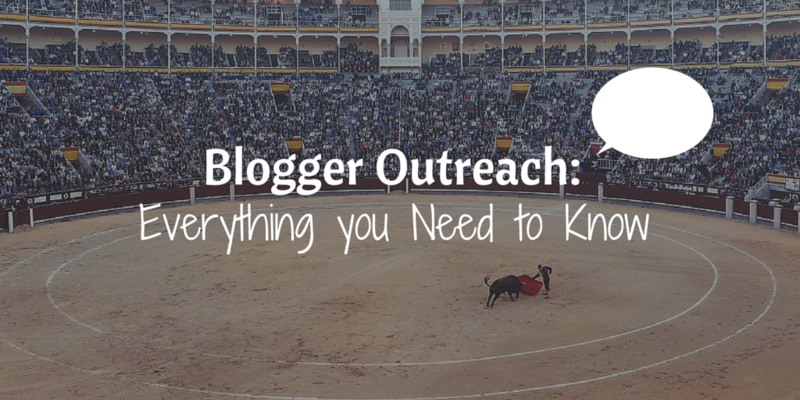 Here is some inspiration of successful blogger outreach campaigns from Ninja Outreach. Next up you need to make a decision about what you will offer the blogger in exchange for your desired outcome. There’s no such thing as a free lunch, and in the blogosphere this is truer than ever. There are two ways you can go about this; earning your outcome or paying for it. ‘Earning’ your outcome refers to strategies that require no financial incentive for the blogger. Instead, you will seek to understand what the blogger values and search for a win-win scenario. Maybe you can provide them a link on your site, a testimonial, promotion to your email list or access to information such as research data. It is much harder to get your desired outcome if you don’t pay for it, but much more rewarding. Alternatively, you can offer something a little more tangible to the blogger in exchange for your desired outcome – the ‘paid’ option. This could take the form of a free product, direct fees, affiliate commissions or some other form of financial benefit. Search engines frown on ‘buying links’, so I would strongly recommend to steer clear of this practice. But paid arrangements can certainly help achieve your desired outcome, and encourage the blogger to come to the party. I have focused on earning the outcome I want with blogger outreach, compared to paying for it. So this post will lean towards that alternative. Task 2: Decide what you will offer the blogger in return for your desired outcome. You have already made a couple of decisions about how you will approach blogger outreach. You’ve decided exactly what you are contacting the bloggers for, the outcome you desire. And you have figured out what you can offer that will encourage the blogger to participate in this relationship. It’s important to document all of this information along the way, it will start to take shape as a part of your overall blogger outreach strategy. My advice would be to do this in a spreadsheet where you can house all the valuable information you need on the topic – feel free to download the one designed for this post and use it as a starting point. The next step is to pick who you will target with your blogger outreach strategy. It may seem obvious, but it is easy to aimlessly go about your business, contacting a blogger here or there over time and getting very little traction. Trust me, I’m guilty of taking this approach! Who has significant influence over your ideal customers? Which blogger’s have an audience which is tailor made for the content you are producing or the product you are pedalling? This step is a necessary evil if your outreach strategy is going to be successful. Don’t overcomplicate the information you are looking to capture in the spreadsheet. Their blog URL is important, as well as their name and an estimate of their overall influence on your customers is a good start. To make it easier for you to stay on top of, I would recommend keeping communication channels to a minimum. Ideally this will be an email address, but other adequate ways to contact influential bloggers is via Google+ or the contact forms on their site. However you plan on contacting each of the bloggers on your list, put it into the spreadsheet. Beyond that you don’t need much more information. You will see in my spreadsheet above which information I collect, but this may differ depending on your desired outcome. Thrust.io is a tool which predicts the email address of someone based on their domain and full name. I have found it really helpful when doing this process. Tip: I use the spreadsheet as a bootstrap version of a CRM tool by adding a ‘notes’ section for each blogger. For example, I know that Adam Franklin (Bluewire Media) runs marathons, Jeff Bullas is addicted to cycling, and Courtney Seiter (Buffer) set herself a goal to read a book every week in 2015. I include a lot of this information in the spreadsheet, because I trust that it will always be there, and I can personalize the relationship next time we meet – better than relying on my memory alone. Task 3: Create a spreadsheet to capture the relevant information of the bloggers you will approach, or use the one provided as a download here. Before we jump into the research phase of finding the most relevant bloggers in your niche, it’s important to set some standards. Much like you wouldn’t approach every guy (or girl) at a bar and ask them for a dance, you don’t want to approach every single blogger you find in your niche. What characteristics typify the type of blogger you will reach out to? What is a minimum requirement for that blogger making it into your spreadsheet? Obviously these buckets are very contextual and rely on my own judgment and insight. But I have found it very useful to distinguish who makes the cut, and who doesn’t, using these criteria. You may like to do the same. Task 4: Jot down some criteria, or make a mental distinction, for who makes the cut and who doesn’t. Record these minimum standards in your spreadsheet. Perfect, you have a system all set up to capture the relevant information about each blogger you want to contact. But where do you find the right ones? To get you onto a roll straight away, start with some small wins. Load all of your favorite bloggers in your niche into the spreadsheet. I’m sure you have 5 or 6 people that come to mind immediately and would be great candidates for a blogger outreach effort. But don’t be too picky – if you are sitting on the fence or debating every person you put on this list, you won’t make much progress. You can always come back later on and refine the list before you send out the emails. Task 5: Add this initial list of bloggers into your spreadsheet. At this stage just put all the information into one tab, we will break it up later. Once you have a list of the obvious bloggers it’s time to go out and discover some more influencers you may not currently know about. There are tons of ways to research who these people may be, I have cherry picked the best tools and strategies that have worked from my personal experience. Before researching potential bloggers to contact, we need to figure out what you will be searching for. I’m assuming at this stage you have done some keyword research for your site. Or at the very minimum you could jot down a list of keywords you’re targeting in your content. For the purpose of this exercise you will need some broad keyword topics and a list of associated long-tail phrases in your armory. For example, ‘property prices’ may be a broad keyword topic a real estate blogger would use. An associated long-tail phrase from that may be ‘Australian property prices graph’ – if this real estate blogger is based in Australia. If you are unsure on how to figure out some long-tail phrases to target there are two really easy ways I use to find them. The first is ‘Google related search’. Type your broad keyword topic into Google and scroll down to the bottom of the first page of results. You will see a list of related search terms that people have been searching for on this topic. Grab these related terms and put them into your spreadsheet. To take this to the next level you can even click on some of these terms themselves and discover the long-tail phrases Google relates to them – this will help you make associations between topics and extend your research. The second way to find long-tail phrases is to use KWFinder.com. Just as you did with the Google search, type your broad keyword topic into the KWFinder search function. On the left hand side of the search results you will discover a decent sized list of related search terms (or long-tail phrases) – capture the ones that make most sense to you in the spreadsheet. Now that you have your search terms defined, it is time to start discovering content. Lets start with Google because it is the most universal platform for finding bloggers – everyone can quickly use a Google search to discover content and influencers. Regardless of the criteria you have chosen for selecting potential bloggers to contact, Google will deliver you a few options. For example, if you are interested in accessing bloggers with significant ‘domain authority’ – they will turn up on the first page or two of a Google search. Alternatively, if you are more interested in bloggers with a big email list or a lot of traffic – the mere fact that they turn up on page one or two means they are getting some pretty decent traffic and probably converting that into a list. Afterall, organic search delivers the most amount of traffic to websites above any other source. Tip: Before conducting your Google search I would install the MozBar from the Chrome App Store in your browser. When activated, this gives some really quick insights into a site’s authority and potential influence in your niche. See below what it looks like in a Google search. Individually search for all of your long-tail phrases in Google and capture all the bloggers that seem like a good fit for your criteria. To make this manageable I wouldn’t go any further than the first two pages of a search. Information you might like to capture is the blogger’s name, the root domain for their blog, the domain authority, amount of social followers, a link to their social accounts and some contact information. Task 7: Use your keyword topics and long-tail phrases to conduct a series of Google searches. Document a list of bloggers that relate to each term in your spreadsheet. When looking for bloggers to reach out to, a Google search can be both helpful and limiting. Essentially, any site that turns up on the first page of a search has already established a decent level of authority based on whatever topic you have searched for. But you are limited to the exact terms you choose to type into the search. This means some influential bloggers may slip through the cracks. 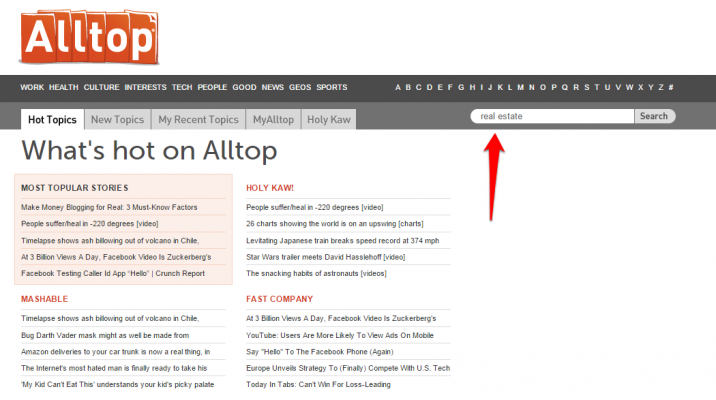 AllTop is a site that curates blogs from all over the web into a user-friendly list. It is a great way for you to discover new blogs in your niche, and subsequently find influential bloggers you may want to get in touch with. Unlike searching in Google, you will get better results in AllTop by using broader keywords – rather than long-tail phrases. In the ‘property prices’ example, I would probably scale that back another step and just search for ‘real estate’. Once you hit the search button, AllTop will drop down a list of potential topics that relate to ‘real estate’ – or whatever keyword you are looking for. See below. Remember the criteria you set yourself earlier in this process and begin to capture a list of relevant blogs you think you will want to target later. Don’t be obsessive about the quality at this stage, just go with your gut and we can clean up the clutter later on. Task 8: Use your keyword topics to search AllTop and document a list of bloggers/blogs in your spreadsheet. Here comes my favorite tool for discovering influential bloggers. BuzzSumo! BuzzSumo is a search engine in itself that ranks content based on social shares, backlinks and a select few other factors. First up, head over to BuzzSumo and search for your broad keyword topic. On the first page of the search results you will see all of the content associated with that keyword phrase from the last 12 months – ranked by social shares. Social shares adds a different element to your research and will give you an idea of whether a blogger has significant social reach. Whilst we are on this page, dive a little deeper by searching for all the long-tail phrases you defined earlier. Capture all the relevant bloggers with a decent amount of social sharing based on all of these keywords. But the fun doesn’t stop there! Once you are done with the social media ranking in BuzzSumo there is another way to discover some pretty all time bloggers you may want to connect with. Type in your keyword and click on the ‘Influencer’ tab at the top of your browser. Boom! BuzzSumo just listed out all of the influencers for that keyword based on their unique algorithm which includes factors such as domain authority, social media followers and engagement. This is a goldmine of potential bloggers or influencers you will want to capture in your spreadsheet ready for outreach later on. Task 9: Use BuzzSumo to discover relevant bloggers in your niche and document them in your spreadsheet. OK, now you are probably a little bit overwhelmed. In your spreadsheet there is a sea of raw data and information about a whole bunch of different blogs and bloggers. What can you possibly do with all of that information? This part can be a little tedious, but it is essential for the long-term viability of your blogger outreach strategy. Based on the criteria you have chosen, and the metrics that support that criteria, split your bloggers as best you can into segments. You will see below I create multiple tabs in the spreadsheet for this step. For me this would be splitting bloggers or influencers into ‘social shares’, ‘backlinks’ or ‘relationships’. You may have chosen different factors or outcomes than me. Don’t worry too much if you think a blogger fits into multiple buckets, you can add them into all of them if you want – the point of this step is to make the reachout process more targeted based on the outcome you are looking to achieve. Once you have all of your prospects in different buckets, order them from most influential to least influential based on the criteria you have selected. Eliminate the top 5% and bottom 5% on each of your lists. The idea behind this is that most likely the top 5% on your list will be pretty hard to get in touch with, and the extra effort it will take won’t necessarily get you any added benefit. On the flip side, the bottom 5% are the ones that slipped through the cracks. They may not perfectly fit into your target group and the effort it will take to reach out to them won’t get the benefits you are after either. The sweet spot is in the middle of these groups – this is where you will find the quickest, easiest and most rewarding traction with blogger outreach. Task 10: Refine your list of bloggers down to the ones that really count with a goal of including a minimum of 30-40 for each segment. Most people skip this step, and it is a fundamental reason why blogger outreach is so ineffective. Before asking anyone for anything, you need to place ‘deposits’ in their metaphoric bank account. This is a concept spoken about by Stephen Covey in ‘7 Habits of Highly Effective People’ – a foundation book for anyone looking to win at life and business. These deposits are honest and sincere – they make the other person feel important and progress an appropriate want or need of theirs. They are the first step on a journey of relationship building. Ok, that got a little deep. I’m not trying to be Dale Carnegie or Stephen Covey here… But I am trying to reinforce the power of relationships in digital marketing. At their essence, online relationships aren’t all that different to any relationship in the real world. So the psychology remains the same. Give more than you ever wish to receive, and the benefits will follow. Task 11: Pick 3-5 bloggers from your list to target first – otherwise all of this will get overwhelming and you won’t do any of it properly. So what type of ‘deposits’ am I talking about? How can you start to forge a relationship with these influential bloggers you have mapped out in the spreadsheet? When you are sharing someone’s content on social media you have to make it standout. The best way to do that is to personalize the way you share it based on what you have read. For example, on Twitter you may include a small bit of commentary or a quote from the middle section of their blog. This way they know that you actually read the content. Another thing you could do is to share the post with one of your contacts directly and tag both the blogger and your contact in the post. This is the virtual version of matchmaking, and it makes both parties feel important. Whichever social network you choose, make sure you tag the blogger in your post so they definitely find out about it! I haven’t heard of many people doing this, and it kind of shocks me. I guess most marketers are so obsessive about their email lists that unless there is an affiliate relationship with someone they’re cautious about wasting valuable links without including a direct route to their OWN benefit. How about this instead. Send out an email to your subscriber base promoting the content of someone you are trying to connect with. Share something they will really value, put your stamp of approval on it and encourage your audience to check it out. But how will they ever know that you did this because the email you send won’t be publically available? By including your company name, or your name, as the source of this URL when it pops up in the blogger’s analytics as a ‘New Traffic Source’ it will be associated to your brand. Bingo, there is a warm entry if I’ve ever seen one! Another more obvious place you can share the content of these bloggers is within your content itself. If you are writing a blog post about a topic that this blogger is an expert in, link back to content they have created on the topic. I do this quite regularly. This is gold for them. You just gave them a backlink, shared their content with your readers and increased their authority in your niche. Now that is a deposit if I’ve ever seen one! When commenting on people’s blogs it is important to take a unique standpoint. If you drop in with an ‘Awesome Post’ or ‘This was so helpful, thanks Jimmy’ comment, you are not going to standout from the crowd. But if you put a little more thought into what you are going to write, complement what their article has said and extend on that with a unique viewpoint – then you get their attention. To really get a blogger’s attention you want to be commenting regularly, and you want to be first off the blocks. Find out what time they typically post a blog and be waiting for it to go live. Make sure you are the first person on their comment stream for a few weeks running. That will get you noticed. Signing up for a blogger’s email list is an essential element of the ‘placing deposits’ step. Usually what this does is it gives you their email address (even if it isn’t one they use personally), and it means you are part of their community. Do this by getting very specific about a blog you read of theirs, something you shared to your audience, or something that genuinely benefited your business. Thank them, and leave it at that. Deposit made. If the blogger has written a book or hosts a podcast they would love you to go and review it. Apart from the fact that it makes them look good, both Amazon (for books) and iTunes (podcasts) are search engines in and of themselves. What this means is that they need a way to rank things when people search for certain keywords. Reviews, positive ones more specifically, are one of the most important ranking factors in this algorithm. In plain english – if you review someone’s podcast or book on one of these platforms, it helps them get discovered by more people. Let me share an example of where this has played out for me personally. I can’t even begin to elaborate on how much that relationship has developed since then, and I can trace it all back to that one act of reviewing their book on Amazon. If you want to take this to the next level and attain some serious street cred with these bloggers, this one is a doozy. Whatever they are selling, be it an eBook, information product, online course or software of some sort – buy their product. Use their product. Then, approach them offering a genuine testimonial about your experience. Bloggers and marketers alike LOVE testimonials. If they get them without having to chase them down, they will remember the person who offered it to them. This is a big time deposit. One last way you can place a deposit with these bloggers before asking for anything in return is to help them meet other people in your niche. These connections are extremely valuable to people because online marketers realize that relationships are the key to opportunity. Who do you know that they don’t? How could you get them to meet each other in a way that will benefit both people? Before we move onto the next step, there is something important to note. You don’t need to use ALL of these tactics for placing deposits with bloggers. I would recommend cherry-picking the ones that best suit both you, and the person you are reaching out to. People value different things and the better you can get at intuitively understanding what each person values, the better results you will see. The hard work is done. If you have placed enough quality deposits with the right bloggers, they should be eating from your hands. Now for the fun stuff – getting a little something in return. Make it easy for them – whatever it is you want them to do, put the grunt work in yourself. For example if you want a Tweet, pre-craft it for them. If you want to guest post, follow their guidelines within an inch of your life – and then go a step further. Don’t expect anything in return – even though you have done so much to help these bloggers out, you have to go into this situation disconnected from the outcome. Maybe they have a deadline to meet, or your email slips through the cracks. If you can’t take rejection or complete ignorance in some cases, don’t do blogger outreach. Be thankful – whatever minor thing they do for you in return for everything you have just done, make it a big deal. Make them feel like they have just contributed a huge value add to your life. Want the relationship more than your articulated outcome – if after all of this effort you don’t get exactly what you were after from these bloggers, BUT you progressed your professional relationship with them. That is far more valuable than any social media share or link. Value that relationship like it is gold, because it is. Email is the best form of blogger outreach when you are asking for something in return. It is more personal than social media and captures the blogger in a place where their guard is less likely to be up. It strokes their ego – use this opportunity to position them as an expert, it makes them feel good. But make sure you are genuine about it. See below a blogger outreach email template that I use to gain social shares – feel free to use it yourself! Tip: If you are looking for some blogger outreach tools to make this process easier, you may like to try out BuzzStream or YesWare. Both offer some nifty paid alternatives to the bootstrap ‘spreadsheet model’ I have offered in this post. So now you have a few new influential connections who are sharing your content – when you ask nicely that is. Don’t stop there. Use this momentum to your advantage. Go back to your spreadsheet and pick your next 3 to 5 targets and repeat steps 4 and 5 – place deposits, and ask for something. Over time you will become a fine tuned outreach machine! But what about the bloggers who just did what you asked them to? Is that the end of that chapter? Don’t waste the opportunity to continue strengthening your relationships with these bloggers. Nurture them into long-term advocates and potential joint venture partners of the future. They are influential with your target market remember. Don’t forget their birthday! This is just my cheeky way of saying that the little things count. Along the journey whenever these people tell you something about their life, their hobbies or their family – keep a record of it. And if you can figure out their birthday, schedule it into your calendar to drop them a note on that day. Effective blogger outreach allows us to connect with people that have significant influence over our ideal customers. This is priceless. But there is no luck in a successful outreach strategy. It is meticulously planned and tediously implemented. Define what success looks like. How can you achieve something if you aren’t clear on what it will feel like when you arrive at the destination? Offer something of value. What do these bloggers actually care about, and how can you fulfill that desire? Be selective. Vary your search platforms to find influencers, but be targeted in who you select. Be generous by placing deposits at regular intervals. When the time is right, ask for something. Don’t beat around the bush. Make it all mean something by nurturing these relationships over time. The rest is up to you. If you’re ready for the challenges ahead, download the spreadsheet and one-by-one make your way through the 21 tasks outlined in this post. Are you ready to flex the muscle?